People have different reasons for wanting a pool, and your reason is crucial to ensuring you choose the right options. A savvy pool builder will ask the right questions about their clients’ lifestyles as a way to propose the ideal pool design for each client. Here are the top 10 lifestyle questions when it comes to swimming pool design. 1. What Type of Swimmer Are You? Are you strictly a recreational swimmer, meaning you mostly sit or float in the pool? Or, do you swim mainly for exercise? Most people who primarily swim for exercise are going to want a long, straight pool in which to swim laps. They tend to prefer utilitarian designs like traditional, geometric pool shapes. Most recreational swimmers spend less time swimming than they do lounging in or floating on the water. Recreational swimmers usually lean more toward designs that feature benches and sometimes decorative options. Though new buyers may not realize it, the pool deck often ends up being more important than the pool itself. Establishing what types of swimmer(s) will be using your pool the most is one of the basic questions a pool builder should ask. Pool owners with kids typically like their pools to have more area in the shallow end and less in the deep end or no deep end at all. They also want a pool design that is conducive to activities children enjoy, such as games and water sports. Obviously, safety is a major concern for buyers with children, so they will want to team with a pool builder who can offer options and materials chosen with safety in mind. That could be anything from the design of the pool to the type of paving used on the deck to the latest in security features. 3. Do You Entertain Often? Maybe you’d like a large pool if you plan on doing a lot of entertaining. The deck also becomes more important since it will be the setting of your outdoor gatherings. Perhaps a large grill and built-in audio features are desirable for a pool owner who plans to entertain a lot. An experienced pool builder can offer a range of options for pool and deck to suit many entertaining requirements. 4. What Are Your Aesthetic Preferences? Some people want a rustic backyard oasis. Others prefer classic lines and a more sanitary look. Still others want the most modern design with the latest technology. Whatever your preferred aesthetic, the pool builder you choose should not only ask you about it but also be able to make those wishes a reality. If your preferences don’t fall into one category, ask potential contractors about their custom work and choose one who can demonstrate their experience with unique projects. 5. Do You Like to Cook? 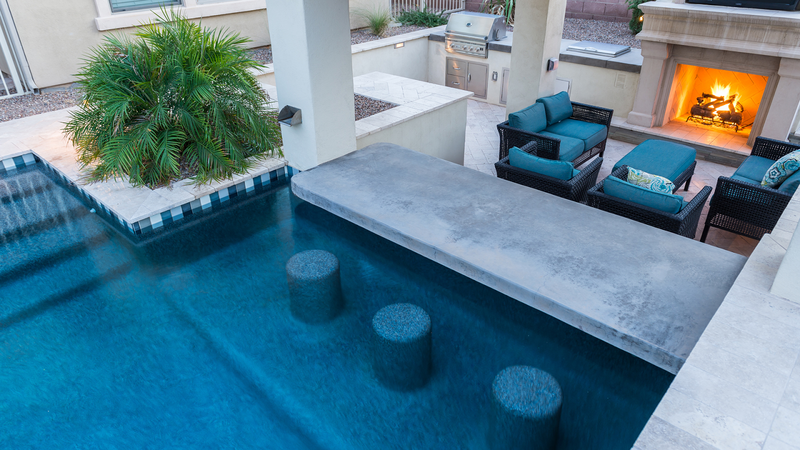 An outdoor grilling area and even outdoor kitchen can be chief considerations in the design process for a pool owner who enjoys cooking and easy entertaining. 6. Do You Prefer to Create Things Yourself or Rely on Others? A customer who likes to have a lot of control in the design process would do well to partner with a company that can help make unique ideas a reality. On the other hand, some people prefer a pool builder who can offer them many ideas and options to choose from. Expert pool contractors should be able to easily work with both types of clients. 7. What Are Your Favorite Outdoor Activities? Perhaps there are outdoor activities and sports that should be considered in the design process. To name just a few, pools can be set up for water volleyball or basketball and pool decks with sand play areas or putting greens. There are dozens of recreational options out there that are easiest to plan for during the design phase. 8. Do You Often Seek Change, or Do You Prefer Permanence? Some designs and materials are easier to update or remove and remodel than others. For example, grout-free interlocking pavers are relatively easy to remove and replace, so someone who is constantly updating the look of their yard might consider that a good option. There are plenty of options available for customers seeking timeless designs as well. 9. Do You Know About the Latest Innovations in Pool and Deck Design? Some folks with certain lifestyles may not even be aware that the perfect fit is out there waiting for them. Smart pool contractors not only want to learn about their clients’ lifestyles, they should also come to the table prepared to educate and inform their clients on new innovations and ideas that could provide just the perfect match for discerning clients. 10. Is There Anything Unique About Your Lifestyle That Would Affect Your Pool and Deck Space? Do you have any family members with disabilities who would require certain accommodations in the landscaping or pool design? Do you have pets and do any design considerations need to be made because of that? Perhaps eco-friendly pool options are a must. Whatever your unique lifestyle circumstances, you’ll want to work with a builder who understands your desires and your vision and makes it their first priority to meet all your requirements.